This is a big cash game and you won’t believe how many zeros are in front of your eyes when you hit the big time betting max. The graphics and music are like something out of a kids cartoon and enhance what is a game for those serious slippery slot slayers out there. With music that reminds me of being on a carousel, this brightly coloured game is only sluggish when it comes to its reel graphics. When you get a payline of our furry little friends, the music speeds up and sounds like something the flappers from the 1920's would dance the night away to at an old fashioned, lively dance hall. You are going to want to hit the high notes with this Cashapillar slot game; when the trombone music kicks in, you know the coins are mounting up. Hit the bonus cake symbols and you are in for a cash treat. 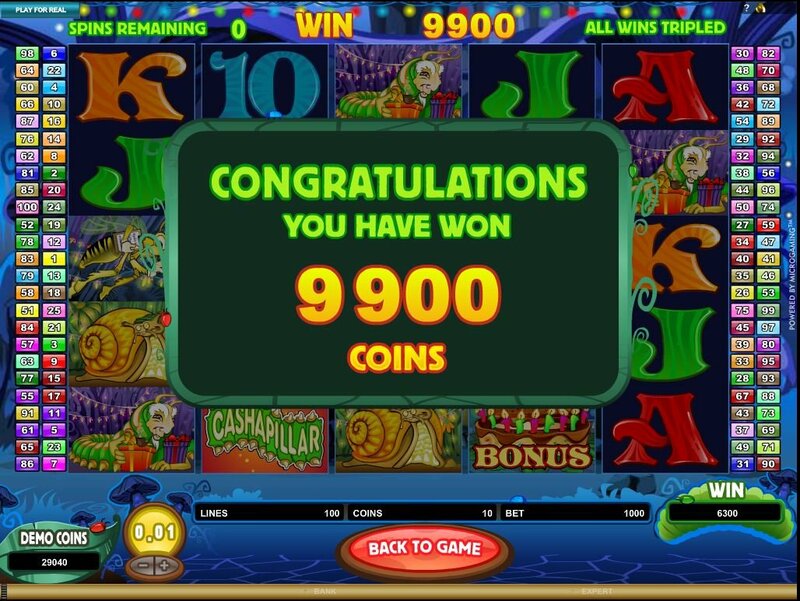 You can win up to 6 million coins if you're betting max on a free spin. The cashapillar doubles your winnings if it is stacked on every reel and, if it is substituting all wins are doubled. A combination or 3,4 or 5 bonus cakes will activate 15 free Cashapillar spins and, hitting a cashapillar during one of these free spins will win you up to 6x your line bet. All free spin wins are tripled for an added bonus! With the gamble feature, you can take some time out from the spinning and turning of the reels to pick red or black. It gives you a handy chart of the previous suit colours so you can try and beat the odds to win your Cashapillar gamble. All free spin wins are tripled for an added bonus! This 5 reel, 100 line slot is full of garden variety bugs and creepy crawlies, mixed with coins. Coins as far as the eye can see. 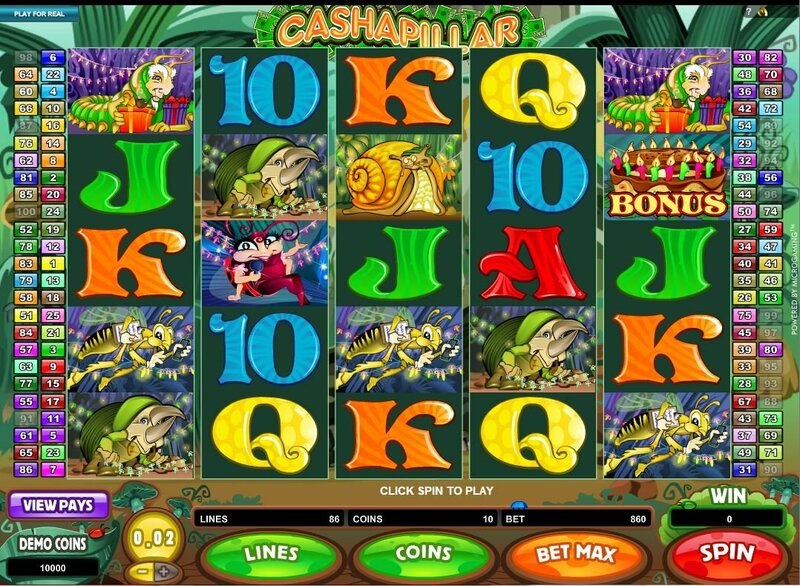 This is one Cashapillar Slot jackpot you are going to want to hit. Microgaming is a sure fire bet that seemingly hits it out the ballpark with everything it touches turning to gold coin. 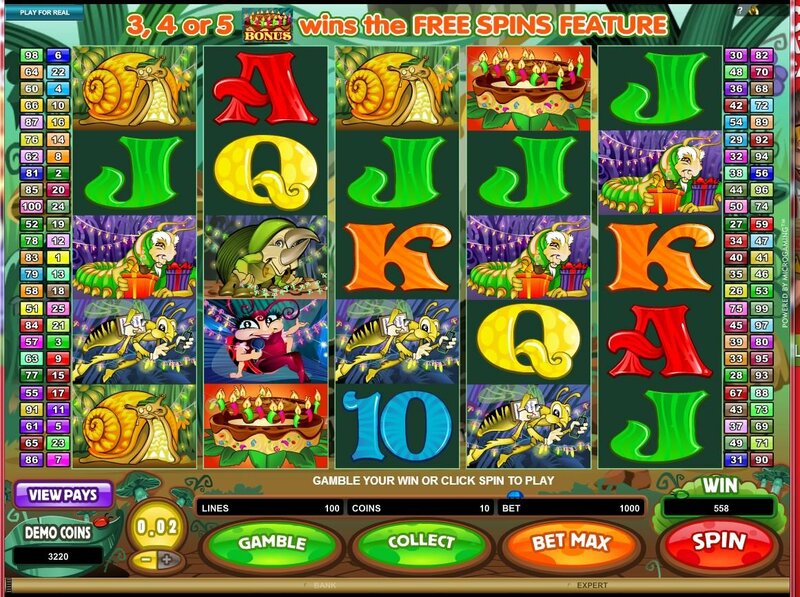 The music will jazz up when you hit your free 15 spins too and, the changing colour of the background is further proof your slugs will come crawling in with their gold coins without you needing to lift a finger! -So many paylines you will be seeing lines!